When gearheads aren't trawling Craigslist for the next old-lady-owned Chevrolet Chevelle tucked away in a barn, they're dreaming of cool places to put their toys. Usually, dream garages never become reality. 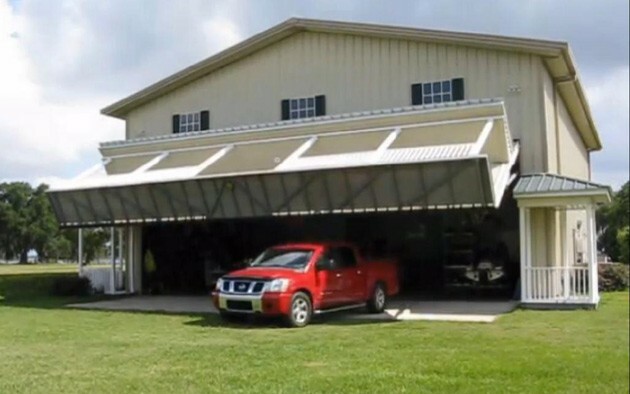 It's rare to find someone with enough ambition and/or cash to make it happen, but credit one Florida couple for creating something remarkable: the Hangar Home. Their house's rear facade doubles as a garage door that conceals a cavernous work and storage area, complete with a set of cushy-looking armchairs for when the weekend project is over. We can't imagine how long this place took to complete, but all the time and effort really paid off. Click past the jump for two videos of the Hangar Home in action.